Nagasaki Airport (長崎空港, Nagasaki Kūkō) (IATA: NGS, ICAO: RJFU) is an international airport located 4 km (2.5 mi) west of the railway station in the city of Ōmura and 18 km (11 mi) north northeast of the Nagasaki railway station in the city of Nagasaki, Nagasaki Prefecture, Japan. The airport terminal and runway 14/32 are on an island, and the shorter runway 18/36 (now used by the Japan Maritime Self-Defense Force for helicopter flights) is on the mainland. The mainland portion of the airport opened as a military aerodrome in 1923, and commenced civilian joint use as Omura Airport (大村空港) in 1955. The current island runway and terminal opened on May 1, 1975, and became Japan's first full-scale airport built over water. 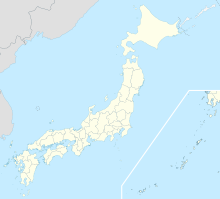 Although Nagasaki is superficially similar to Japan's other island airports, Kansai International Airport, Kobe Airport, Kitakyushu Airport, and Chūbu Centrair International Airport, Nagasaki's island existed (in a radically different shape) before the airport was constructed. Constructing the airport required flattening the island's hills and forming landfill around its shore, expanding it from 0.9 to 1.54 km2 (0.35 to 0.59 sq mi). The island had 66 residents in 13 households, all of whom agreed to relocate so that the new airport could be built. Nagasaki's first international service, to Shanghai, commenced in September 1979. The main runway was extended from 2,500 m to its current length in 1980, and the old mainland "A runway" (18/36) was abolished in 2010. July 29 2017 - A small propeller plane was on a short final approach for Nagasaki Airport when it belly landed because its landing gear failed to lower. The airport was closed down and the JTSB is investigating. Several companies provide scheduled bus service to the airport from Nagasaki, Shimabara, Sasebo, and other surrounding cities. Ferry operators provide service to Togitsu, Nagayo, and the Huis ten Bosch theme park. ^ "Nagasaki Airport" (PDF). Japanese Ministry of Land, Infrastructure, Transport and Tourism. Archived from the original (PDF) on 21 October 2016. Retrieved 7 January 2017. ^ a b c "Airport Overview". Nagasaki Airport Building Co.,Ltd. Retrieved 2018-08-03. ^ a b "大阪航空局_大阪航空局のご案内_管内空港の現況と出先機関_長崎空港". ocab.mlit.go.jp. Retrieved 2018-08-03. ^ "에어서울, 10월부터 아시아나 日 노선 순차 인수". NEWSIS.COM (in Korean). 15 July 2016. Retrieved 18 July 2016. Wikimedia Commons has media related to Nagasaki Airport.